My religion is compassion. Since 2010 I have been working on a documentary about faith. From the very start of my career as a photographer I have wished to show that in front of God people are equal. My religion is compassion. Since 2010 I have been working on a documentary about faith. From the very start of my career as a photographer I have wished to show that in front of God people are equal. My brief conversation with the Dalai Lama in 2011 made me believe that the idea for this documentary did not come about by chance. I would have liked to dedicate more time to this material, but discrimination, segregation, lack of access to health and education, the problems facing the elderly, drug abuse, prostitution, and abandoned children were issues that always took first place. In a way, I had to be faithful to my faith above all else. Throughout this time I crossed paths with Orthodoxy (of both the old and the new rite) and to a far lesser extent with Pentecostalism. The greater part of the time I spent with Jews. After numerous religious holidays in Romania and a number of trips to Israel, in March 2017 the opportunity arose for me to take part in a pilgrimage of Hassidic Jews to the tomb of Rabbi Tzadik Elimelech in Lezajsk, Poland. Jews from all over the world come to pray at his tomb for health, their children’s wellbeing, and prosperity. After twenty-four hours on the road, I arrived in Lezajsk on the evening of 16 March. First of all, I left my camera in the car and set off on foot to familiarise myself with the place. The houses of the former Jewish quarter stand on a hill. Many of them have been recovered by the descendants of the families that owned them before the Second World War. Some have been renovated to serve as homes, others have been converted into guesthouses for some of the thousands of pilgrims who come here. Although it was night, on the hill opposite I could see the building of the holy tomb amid a clump of trees. Only a few gravestones remain from the old cemetery, which was largely destroyed during the war. Between the two hills all kinds of tents had been pitched to serve as venues for various events and for prayers. I picked up my camera equipment and despite reserve on the part of Hassidic Jews I managed to take my first photographs in the kosher bakery. Even now it makes my mouth water just thinking about the kugels baked for the pilgrims. That first evening I met Shlomi Coriz, the man in charge of sound and the video surveillance system, as he introduced himself. Thanks to him I received a VIP invitation to attend the party on Saturday evening that was held for the most important rabbis, the wealthiest families, and the event’s sponsors. The next morning, the chef invited me to attend the service (Shacharit). I have always been fascinated by makeshift synagogues. The synagogue, a small room of no more than fifty square metres, in the far corner of the building that also served as a canteen and a dormitory, was unable to cope with more than thirty worshippers at a time. Most of the pilgrims either queued patiently in the hall or looked for another place to pray. The next day, as the number of pilgrims continued to grow, another canteen was opened in a nearby building. I knew that normally, from Friday evening, at the beginning of Shabbat, it would be almost impossible to take photographs, and so I decided to spent the time walking around. For most of Saturday, it was very cold and rainy. I looked at the Hassidic Jews, who were wearing the same flimsy clothes they had arrived in from sunny Israel, and wondered how they could bear the cold. All they had to protect them from the rain was their skullcaps. Most of them had caught colds, but even so, they still prayed and went about their business as if they were in the best of health. On Saturday evening, buses full of pilgrims began to arrive. On one of the buses I saw a man with a guitar. I boarded the bus before the passengers got off and as I was taking photographs, they invited me to a party. I later found out that the man sitting next to the guitarist was none other than Rabbi Daniel Rokach of Brooklyn, New York. Not long before, Rabbi Daniel had bought a historic building in the town. In his quest to continue the Lizhensk dynasty he plans to use the building as a visitor centre and guesthouse. The front of the building once housed Reb Elimelech’s bais medrash. According to the rabbi, no one else knew that of all the buildings in Lizhensk, this place was the holy Reb Elimelech’s shul. He knew because his family came to visit after the war, but he didn’t talk to anyone about it. The rabbi had come to Poland with around one hundred and fifty people to spend Shabbat in the nearby town of Rzeszow, before arriving in Lezajsk on Saturday night, where events continued with a large scale melava malka (the fourth meal at the end of Shabbat). The next day, the day of the yahrtzeit, Rabbi Rokeach and his group gathered with the thousands who flock to Lezajsk each year for the yahrtzeit, where they completed a new Sefer Torah (hand written copy of the Torah) and enjoyed a festive meal and joyous dancing. I don’t know what kind of miracles others experienced in Lezajsk, but I can say that what happened to me was that in the crush at the bottom of a staircase I found the key to an Audi car. I picked it up and gave it to Rabbi Daniel Rokach. Two days later I found out that the caretaker of the building where Rabbi Daniel’s pilgrims were staying had been very happy to recover his car key. As for me, I strongly believe that miracles large and small are performed only by people and only during their lifetimes. 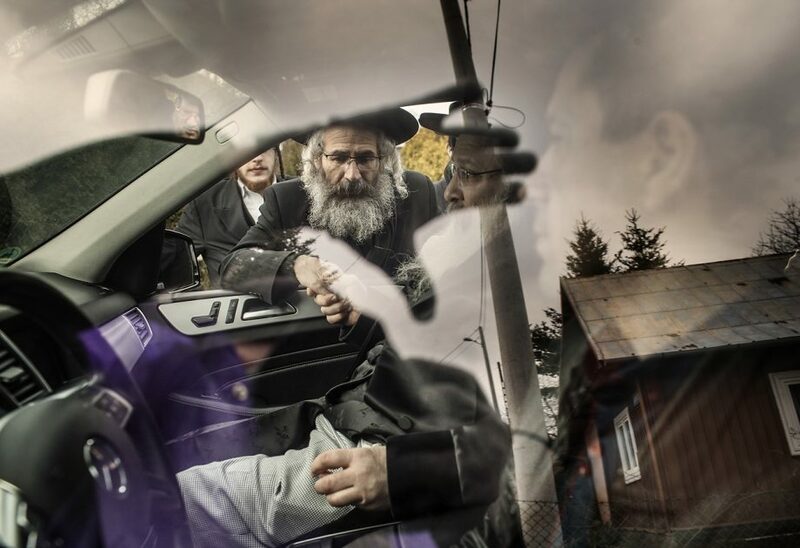 Ultra Orthodox rabbi from Ukraine (passenger seat) arriving to the grave of Reb Elimelech of Lizhensk as seen in Lezajsk on March 19, 2017. In his lifetime Reb Elimelech was known as a spiritual giant, whose genuine love for his fellow Jew was beyond compare. Since his death, thousands have braved the frigid Polish winters to pray at his grave, with many pointing to their pilgrimage as the source of miracles and salvations that have come their way. 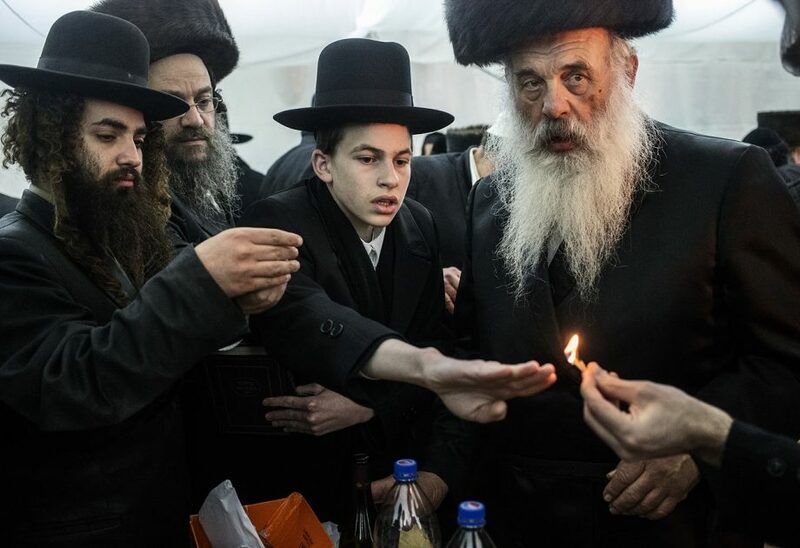 Ultra Orthodox jews pilgrims to the grave of Reb Elimelech of Lizhens, praying on Shabbat, as seen in Lezajsk on March 17, 2017. In his lifetime Reb Elimelech was known as a spiritual giant, whose genuine love for his fellow Jew was beyond compare. Since his death, thousands have braved the frigid Polish winters to pray at his grave, with many pointing to their pilgrimage as the source of miracles and salvations that have come their way. 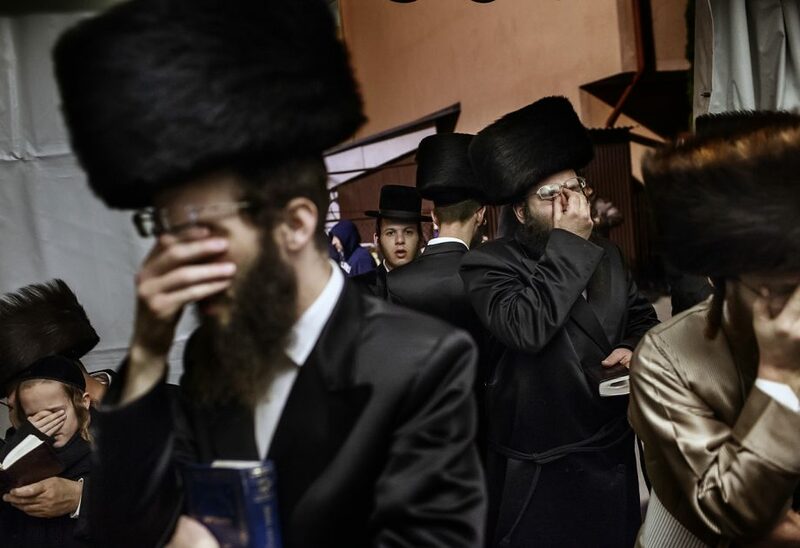 Ultra Orthodox jews pilgrims to the grave of Reb Elimelech of Lizhens, praying at the end of Shabbat, as seen in Lezajsk on March 18, 2017. In his lifetime Reb Elimelech was known as a spiritual giant, whose genuine love for his fellow Jew was beyond compare. Since his death, thousands have braved the frigid Polish winters to pray at his grave, with many pointing to their pilgrimage as the source of miracles and salvations that have come their way. Copyright © 2017 Mugur Varzariu. All rights reserved.